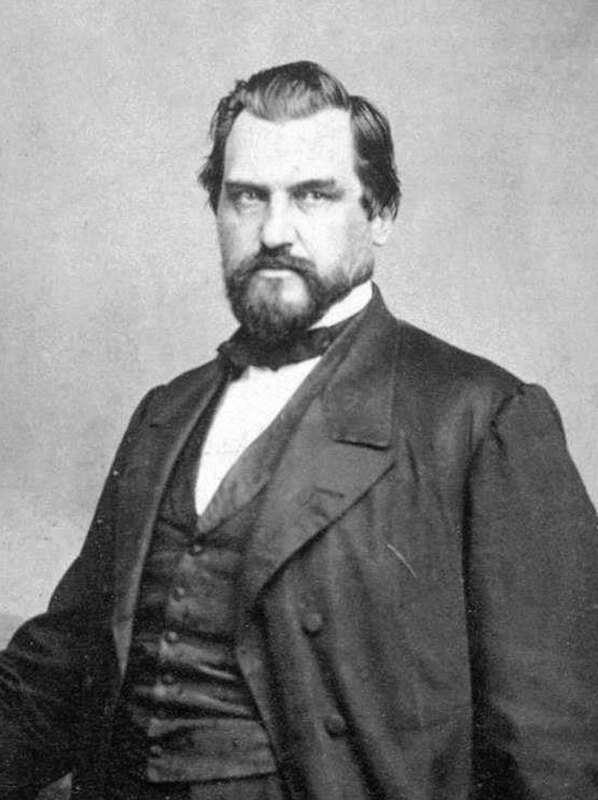 Leland Stanford was born on March 9, 1824 in Watervliet, New York. His father Josiah was a farmer. His mother Elizabeth had eight children. Leland attended public schools until 1836. At that time he was home schooled. He next attended Clinton Liberal Institute before studying law at the Cazenovia Seminary. In 1845 Stanford began working for the law firm Wheaton, Doolittle, and Hadley in Albany, New York. Shortly after passing the bar he moved to Port Washington, Wisconsin, where he began practicing law with his partner Wesley Pierce. In 1850 he married Jane Elizabeth Lathrop. They would have one child, Leland Jr. In 1852, Leland's law library caught fire and he lost everything. As a result he decided to join his brothers in California. At this time, California was still experiencing the Gold Rush and it continued to be rich in opportunities. A short time later, Leland opened a store in Michigan City in Placer County that catered to the miners. Not long after he was making lots of money. In 1856, he and his wife moved to Sacramento to take advantage of larger opportunities. Then in 1859 he ran for governor and lost. However, two years later he ran again and was elected governor. Leland cut the states debt in half while advocating for the preservation of California’s forests. At the same time, he created what would eventually become San Jose State University. In Sacramento, he became one of the four businessmen that called themselves the Associates. However, today they are better known as the Big Four. While still in office Leland Stanford approved massive grants of public lands to the Central Pacific Railroad, of which he was president. His partners were Charles Crocker, Charles Hopkins, and Collis P. Huntington. They broke ground on their railroad on 1863, and construction was completed in 1869. The Big Four named their first locomotive the Governor Stanford. They benefited from huge federal government land grants and the diversion of government funds. In 1864 he and his associates acquired the Southern Pacific Railroad and again Stanford became the president of the company. Before long, the Big Four constructed the Transcontinental Railroad which ran over the Sierra Nevada Mountains and across the states of Nevada, and Utah. Stanford and his partners imported thousands of Chinese to construct the railroad and they paid them very little. Leland himself pounded in the last spike in Promontory, Utah on May 10, 1869. Soon afterward, Hopkins, Crocker and a few others formed the Pacific Union Express Company which later merged with Wells Fargo. In 1865, Stanford was elected to the United States Senate. He would serve their until his death. In his later years Stanford developed extensive vineyards in Alameda County, was interested in photography, and breeding racehorses. In 1885 their son died from typhoid fever and Leland and Jane founded the Leland Stanford Junior University which would eventually become Stanford University. They donated $40 million dollars towards what they hoped would be an agricultural school. Prior to his death, Leland and his partners in the Central Pacific Railroad formed a shell company that had been created with highly inflated costs at the federal government's expense. Leland Stanford died of a heart attack on June 21, 1893. After his death, the government filled suit against his estate to recoup their loses of $15 million. Eventually, his wife Jane won the lawsuit. Jane was poisoned by strychnine and died in 1905.